Filtering: Date filter endpoint input in 2.9? The date filters in version 2.9 look to be only adjustable by scrolling. Is it possible to allow start/end dates to be typed in order to manipulate/adjust date filters, please? 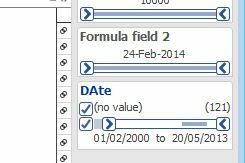 You can double-click on any of the dates in this filter to manually type the top or bottom date range value. This option doesn't work in omni-mobile. This feature has been added to Omniscope Mobile 2.9 build 1180, available to download immediately.